Powers/Abilities: Peter Maher was surgically altered to open the rudimentary gill-slits in his neck, making him amphibious and allowing him to extract oxygen from water. History: (Strange Tales I#41 (fb)) - Peter Maher was orphaned at an early age, and was raised by his aunt on the coast of France. His aunt always found Peter to be a strange, moody boy who only found peace when he was in or on the sea -- it seemed necessary for his happiness, but sometimes it frightened her. Peter met the acquaintance of the visiting American Dr. Bondy, and the two became fast friends. Bondy noticed that as Peter grew to manhood, he seemed restless and always searching for something he could never find. When Peter told Bondy that he wished he wasn't restricted by human breathing apparatus, Bondy told him that there probably was a time when man was amphibious -- "The human embryo still has rudimentary gill-slits...". Peter later purchased an aqualung and people saw very little of him afterwards because he spent most of his time exploring the wonders of the deep, and for the very first time he knew happiness. (Strange Tales I#41 (fb) ) - One year later, Peter visited Dr. Bondy in America and told him the real point of his visit -- even with the aqualung, he was still limited by the time he could spend in the depths, and those limits had destroyed the peace that he thought he found. Peter then reminded Bondy about his theory of the rudimentary gill-slits and asked him if it would be possible to operate and make them functional again. Intrigued by that idea, Bondy told Peter it might be possible to perform surgery on the latent gills and rebuild them, so he researched and discovered a way to successfully perform the procedure. Bondy told Peter the news, but then Peter vanished for six months. (Strange Tales I#41 (fb) ) - Peter met and fell deeply in love with Elsa. Peter asked Elsa to marry him, but she refused because (for reasons she couldn't explain) the sea would always come between them. Elsa disappeared after that, and although he searched diligently for her, Peter could find no trace of her, so he returned to his diving and the solace he found in the sea. (Strange Tales I#41 (fb) ) - One particularly stormy day, Peter found Elsa and saw her diving into the sea. Fearing that she'd drown in the rough waters, he dived down with his aqualung to follow her. Expecting to find the worst since she'd been under for longer than she should, Peter was stunned to see Elsa alive...and gill-slits in her throat opening and closing as she breathed underwater! Elsa darted off and Peter knew he could never catch up to her in her natural element. He then understood why Elsa had refused him -- he was of the land, and she was of the sea! Determined not to give up on his true love, Peter vowed that he would continue to search for Elsa -- but first he must see his old friend Dr. Bondy again. (Strange Tales I#41 (fb) ) - Although Bondy tried to dissuade him, Peter insisted that he perform the operation on him. The operation was a complete success -- the gill-slits in Peter's neck, when closed, could not be seen, but underwater they functioned perfectly, and Peter could breathe as well as any fish! (Strange Tales I#41 (fb) - BTS) - Following Peter's operation, a young girl who had been born with gill-slits in her neck came to Dr. Bondy and had him perform surgery on her to permanently close the gills so she could lead a normal life -- it seems she had met a young man she wanted to marry, but because of her condition, they could never share a life together. (Strange Tales I#41) - Peter's convalescence was swift, and he seemed to have a terrible urge to get back to the sea. Peter took a boat out and dived into the waters wearing an aqualung, but Bondy had a feeling that the aqualung would be found washed up on shore because he didn't think Peter would ever return to land. A tragic story of two lovers who were willing to give up everything for each other -- kind of reminiscent of O. Henry's "The Gift of the Magi". 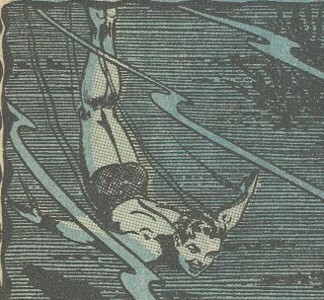 Of course, the artist on this story, Bill Everett, is best known for creating an earlier "fishman" -- Prince Namor the Sub-Mariner. A lot of unused potential with Peter Maher because he's kind of a post-Timely/Atlas, pre-Marvel version of the Sub-Mariner. 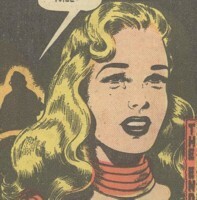 Since he was around in the 1950s, he could always be used in stories involving characters of that era -- the Monster Hunters, the First Line, the "G-Men". 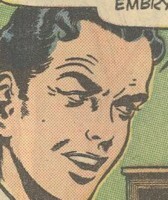 Caleb Alexander theorized that the cause of the Sub-Mariner's frequent rages and emotional upsets was due to an oxygen imbalance in his bloodstream -- perhaps Peter suffered from a similar condition, which would account for his moodiness. Further, perhaps Peter was actually a latent amphibious mutant, which would explain why he was able to adapt to Dr. Bondy's surgical procedure so quickly. Since he lost Elsa, maybe somebody could set Peter up with Linda Brown. Maher isn't the first one to have gills opened in his own neck. A surgeon who looked like the Centaur Comics hero the Shark had opened gills in his own neck in order to breathe underwater and impersonate the Shark. This faux Shark didn't have webbed hands and feet like the real Shark. 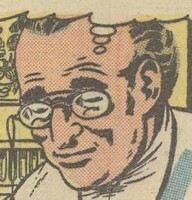 Elsa's last name and Bondy's first name were revealed in Marvel Atlas#1. An American doctor, Bondy was visiting on the coast of France years ago when he met Peter Maher. Learning of Peter's desire to live in the sea, Bondy eventually developed a surgical procedure to rebuild the rudimentary gill-slits in the human neck, which would allow a person to breathe underwater. Shortly after Bondy performed the surgery on Peter, he performed a similar operation in reverse on Elsa, which permanently closed the gill-slits she had been born with, making her a normal human. Possibly a mutant, Elsa was born with gill-slits in her neck that allowed her to survive underwater. She later met Peter Maher, and the two fell in love, but she felt they could never be together because Peter was a normal human and she was tied to the sea. She later had Dr. Bondy perform a reverse operation on her that closed the gill-slits, but unbeknownst to her, Bondy had (ironically) already performed the surgery on Peter which gave him gill-slits and allowed him to breathe underwater. With her true love gone, Elsa could only weep at his loss.